An opening flashback shows Lois informing Superman that they've been outed by Lois Lane, who has revealed to the world that Clark Kent is Superman. The story returns to the present, where Superman is using his super-hearing to find Cora Benning. Superman locates Cora and rescues her, but she has already given away Lois's secret. Superman rushes to Lois and Jon, but they've been abducted before he can arrive. Lois and Jon are left in a room set aflame, while Superman is contending with the supervillain, Blackrock. Lois is surprised when Jon breaks his bonds, and is able to withstand the flames about them, so that they might escape. She realizes that is definitely the son of Superman. Story - 4: This is the wrong week to have too many plot-lines moving about for this critic. The Oblivion Stone, the secret men on the other side of the world, even the flash back, to some extent, they just impede the thrust of the main story, which, thankfully, is top. 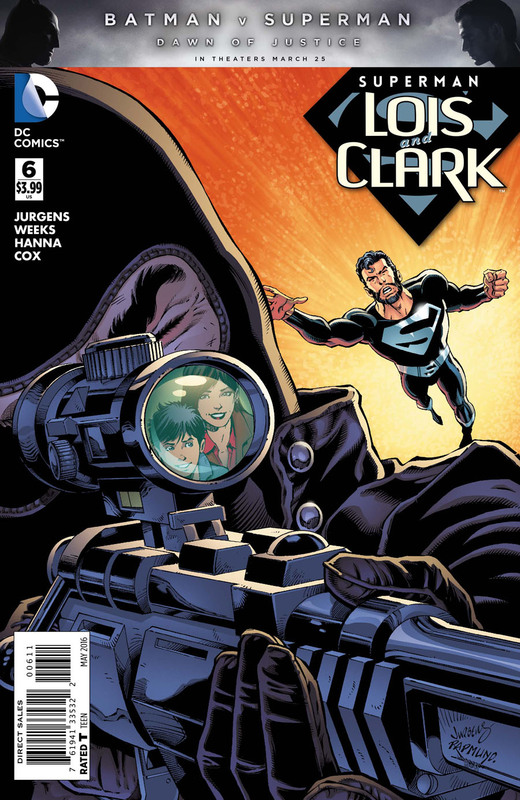 Superman locating Cora is a treat coming from Jurgens, as his character development with Superman is top... but Jurgens isn't known for giving treats in the form of feats. The use of super-hearing is reminiscent of a certain Man without Fear, and such skill with his power could have been used by another super-fellow, who was sorely in need of it. Blackrock provides Superman with a trolley-bunny exercise, but there's never any doubt that he would tend to those in need, even if his own are in need as well. This sets Jon in motion to finally show some seemingly stifled emotion, superbly displayed with bursting his restraints, which is only match by the cool, calm approach he has while being bathed in fire. It's understated and refined, allowing for a satisfying reward the reader receives through Lois, in the form of: "Oh." I'm pleased as punch to see Jon come into the knowledge of his abilities, but moreso to see him displayed as a thinking character, even if a child. While Superman's glasses or beard may dissuade a casual character from suspecting who he is, surely those things wouldn't stave off his own son? Jon has meticulously pieced things together, leaning on the intellect of both his parents, though mostly on his mother's insatiable, inquisitive nature. Jon is a throw back of a DC Comics character: the child hero. What used to be a common character, in the form of Robin, Speedy, Wonder Girl, Kid Flash, and even Bucky and Toro from the Marvelous Competition, has been shelved and replaced by overgrown teenagers mired in angst... if that. DC Comics has the greatest legacy in its superhero pantheon, but that legacy (and if you haven't read Roy Thomas' work with the JSA, please do. It�s great!) after being developed so well, has been abandoned. Twice. Jon presents the opportunity right that error, and with that correction, bring the true new readership that has been missing from comics for too long, the readers the medium was created for in the first place: children. Art - 5: Weeks is such a great artist, I wish I could draw, in hopes I could understand what he does better. The ability to make such captivating images and still excel at telling a story through them isn't an everyday feat, and he's making it look easy. Cover Art - 4: This time it would have worked better with Superman not on the cover and just the "S". Go figure.